Manifesting your dream car into a reality comprises of chain of activities like thorough study of features of the car, securing the right deal, completing the formalities etc, which makes buying a car a laborious activity, both physically and mentally. 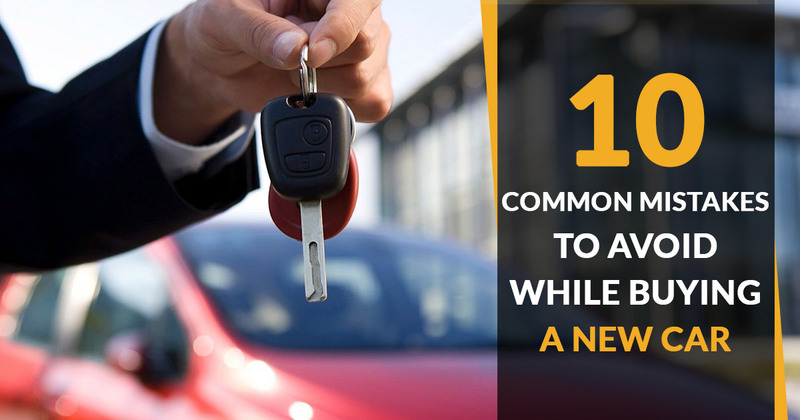 We understand that buying a new car might sometimes feel like a lot of trouble due to the tiring process, so we are throwing light on some of the common mistakes people make when it comes to buying a new car and how you can avoid them. Pre-Delivery Inspection or PDI is an important step which involves the final and thorough checkup of the car before transferring it to you. It is often neglected by the purchasers, as they are not aware of this process, and usually by the sellers also. A car buyer must always ask for PDI certificate even if the seller tries to ignore it so that manufacturer’s fault won’t become trouble for you. Playing dealer vs dealer means getting the quotes regarding prices from different dealers of same car brand and then using it for bargaining. This is an old trick which yields exceptional deals and discounts on the chosen car. If you are car lover and tend to change your car after using it for 2-3 years, then the resale value of the car should not be overlooked by you. Resale value of a car depends on its brand, colour, demand and features, so the car must be well chosen if you want to resale it after a few years. While in case you want to keep the same car with you for a longer period of time then this point becomes irrelevant. Buying the right car at the right time makes the price of the car right for you. If you really want to relish the best discounts on the car you desire to buy then you must look forward for the right time to buy the car as manufacturers offer decent discounts in festive seasons. The discounts are also provided by the sellers at the month ends or quarter ends to meet the expected targets. So, one must keep an eye open to enjoy these price reductions. After sale service is a considerable point while buying a new car for the up-to-date maintenance of your car to ensure its long-life. One must ensure that the service center of the car is accessible and within the geographical reach. Some of the brands do not have service centers within 150 km of the city, so these brands should be avoided, otherwise, after sale service would become a headache and time-consuming task for you. People become utterly bewildered while choosing between petrol and diesel based cars. It depends on the purpose you are buying the car for. If you want to use your car for traveling or for highways, then you must go for the diesel variant, while for city commuting and occasional highway strolls, the preference should be a petrol car. Taking a test drive before finalizing a car is prerequisite. Regardless of the specifications and features displayed on a car sheet or informed by the dealer, the actual suitability can only be calculated by going for a demo ride on the road you prefer or you usually have to take. Driving car on rough patches among other different roads will give you a better idea about the car’s handling and suspension than when driving on a smooth path. Say a strict “NO” to handling charges. If dealer insists you to bear the handling charges, you have the right to deny the same as these charges have been banned by the law and a dealer will have to pay fines for this illegal act. If you do not want to go for legal actions against your dealer, you can contact the customer care department of the brand via mail or phone to ensure the fair deal. Selection of insurance policy is also a major decision under which many factors should be considered like if you are living in a flood prone area then you must go for flood protection cover, and you can also choose third-party insurance if you feel you make a lot of mistakes while driving. Dealers may sometimes charge extremely high for insurance and most customers are not aware of this. This is why it is advised to check out and compare different car insurance quote before purchasing one. Dealers try to earn extra bucks by offering you add on accessories and products. You must, therefore, take a sensible decision while choosing them as to whether it will actually serve me some sort of aesthetic/physical function or is just an artificial gadget whose value will get volatile after some time. For example, Teflon coating and other aesthetic enhancements can be done at many affordable prices from reputed garages across any city rather than getting the same thing done by the dealers at high prices.